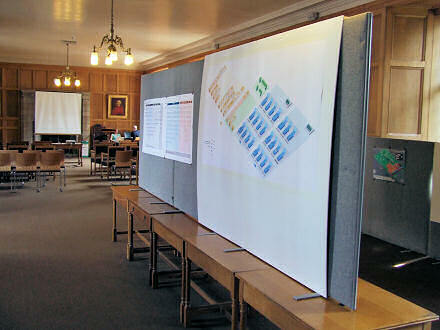 An Information Architecture report displayed in Lower Parliament Hall, St Andrews. 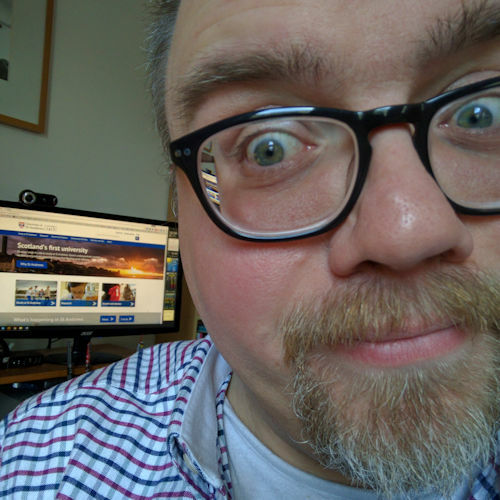 It’s been a busy old week, as we’ve been working on the Information Architecture report by American firm Dynamic Diagrams, hence the noticable lack of blogging action; yesterday was an 11 hour working day, Thursday was over 12. As tiring as it has been, it has never-the-less been a most enjoyable week — as indeed most weeks here have proved to be. Much of the week was spent in the company of two splendid consultants, Kim and Mac, from Dynamic Diagrams an Information Architecture firm from Providence, Rhode Island whom the University are employing to untangle the mess that the current websites are in and present us with a better, more intuitive and usable information structure and design. This is only one aspect of the University’s website redesign strategy. Part of the reason for Kim and Mac’s visit was to present the draft of their Information Architecture (IA) report, which was presented to a group of around 60 members of the University community in Lower Parliament Hall on Thursday afternoon. The response was very positive, and the feedback received so far has been helpful in helping to determine whether this IA is right or whether it still needs tweaking and reworking in places. My part in this aspect of the project now gets busier and more involved as I work through scenarios and current portions of the website and see whether the IA holds up, or whether there will be significant parts of the content left over at the end of the exercise. I can see that I’m going to be spending a lot of time standing in front of the IA diagram (above). It’s a so-called ‘2.5D’ isometric diagram, also called a “Z-diagram” and is a favourite of information architects. Another aspect of DD’s visit was to get a feel for St Andrews as a place. We’d planned for it to be a visit of contrasts: the old and the new, the traditional and the cutting-edge. What we couldn’t plan was the weather and it simply joined in: Thursday was glorious sunshine, Friday was cold and foggy. Following the presentation on Thursday we were able to take a walk to the ruins of the cathedral and climb St Rule’s Tower, which offers a beautiful view over the town and surrounding countryside. 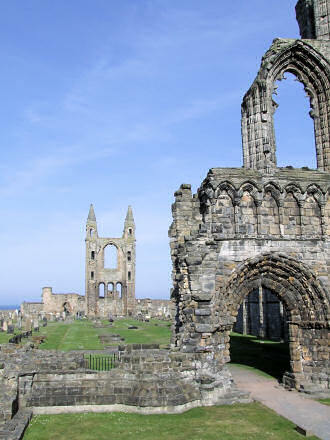 The ruins of St Andrews Cathedral. A view over the rooftops of South Street and beyond. 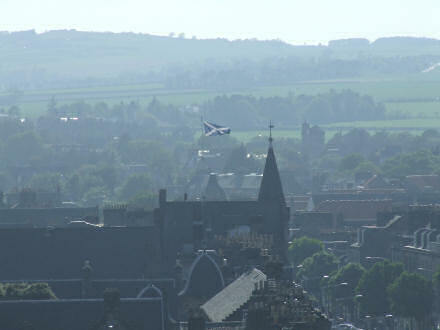 I think the saltire flies from the roof of the Town Hall. Much of yesterday — over 5 hours — was spent working on the IA for the website: are the labels right? what about the categories? are items listed under the correct categories? do these fit with the priorities of the University? do we need an A-Z index, etc. I could have gone on for much longer, had it not been 20:00 and we were all tired, and hungry. Friday evening has never been associated in my mind with stopping work and knocking off the weekend. On Fridays I used to be gearing up for Sunday. Thursday was my day off, and so Friday was my Monday. Anyway, it’s been a great and very productive week at work. Meanwhile, at home I slept, ate, watched some Big Brother, and wrote some more of the Teach Yourself Mahjong updates.